By Rishabh Agarwal in Freelance. Updated on April 9, 2018 . Freelancers usually handle few jobs in the same time and the client is not the only reason that drive a freelancer nuts. Being your own boss you manage your work and unfortunately, you are your own accountant as well. Each project will be charge different fees which will result different billing or invoices flying to your way and that can be painfully messy if you did not do it right. To avoid such disaster, we will be sharing some of the best invoices insurance available around the Internet. In this case, numbers do not need to be your best friends, these invoicing services will handle your billing systems and invoices and some of them are even free.We have included invoice solutions for both big organization and micro business. Here are 15 easy and convenient invoicing services for you to choose! 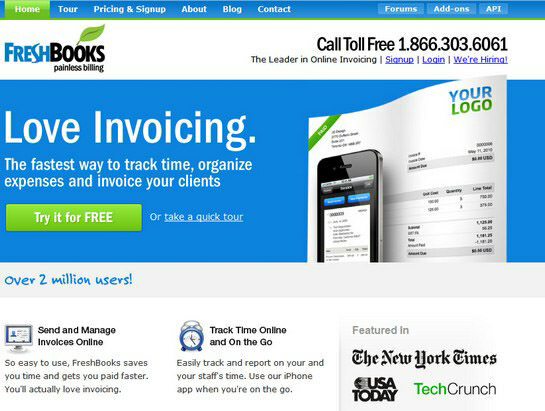 Freshbooks is probably one of the best invoicing service available on the internet. With over 2 million users, this service is really great in all aspects. With an amazing invoice interface and ability to add and manage a list of clients, Freshbooks also enables you to track your expenses in real-time which comes handy if you work on an hourly rate basis. You can also send your clients user id and password so that they can access their invoices online. Freshbooks has a free 30 day trial pack with which you can handle 3 clients at maximum. The paid plans start from $19.95 per month which offer great additional tools and benefits. 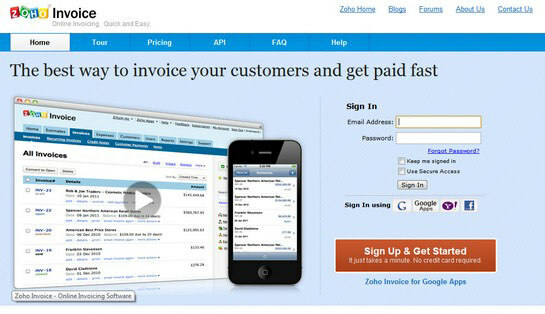 Zoho is another hallmark in invoice creating services. One thing in which Zoho clearly wins is the user interface. The painless and intuitive dashboard with tabbed interface really provides a great user experience. 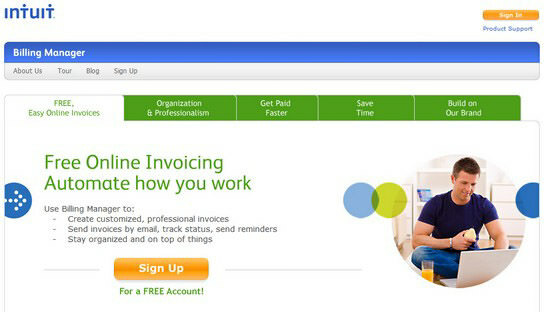 Zoho has many invoice templates integrated that would make the process of creating personalized invoices even easier. Another great feature is that Zoho integrates PayPal and Google Checkout seamlessly in the invoice creation. Zoho offers a free version of its services where you can manage up to 5 invoice/estimates per month with a maximum of 2 users. After that, the price goes from a basic package of $8 per month to the elite package of $35 per month. WORKetc goes a step ahead from other invoice solutions available by serving as not only an invoice solution, but as a total business management tool. 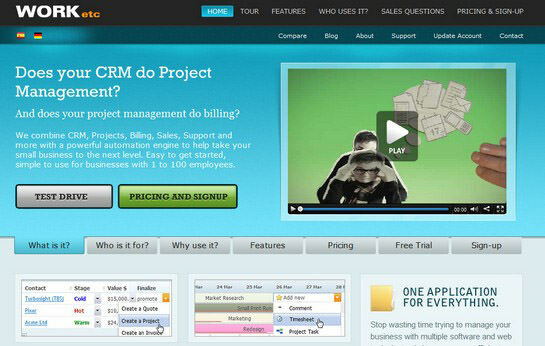 It works as a SaaS (software as a Service) tool and gives emphasis on CRM too. Since WORKetc doubles up as an invoice solution plus CRM, it solves many frustrations that freelance designers face with an invoice billing systems. For instance, over the time, the resources and billing cycles of freelance designers can increase exponentially. In such situations, it might be very difficult to manage all the expenses. Here come the advantages that WORKetc offers. Pricing starts from $29.95 per month. Less Accounting is a minimalistic approach to invoicing. A sleek user interface with no confusing options and menu settings, a plain, minimalistic and usable interface is what Less Accounting is all about. The dashboard is sleek, elegant and simple and provides insights to everything being done in your invoice account. 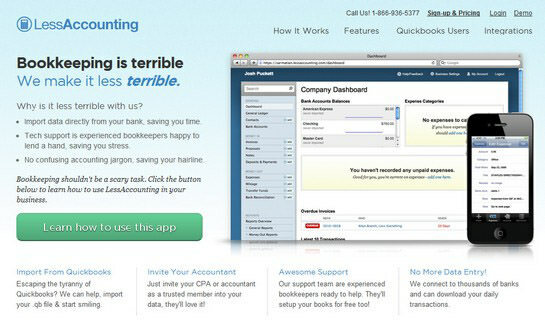 Being minimalistic in design, Less Accounting also integrates expense tracking functionality. And the best part? They also have an iPhone App! With a free 7 day trial, pricing starts from $12 per month. 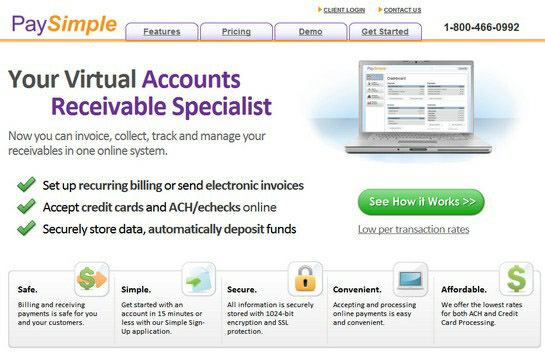 PaySimple is your virtual accounts receivable specialist, as they put themselves. PaySimple combines as a recurring bill setup and invoice sending system which also accepts credit cards and ACH/echecks online. In addition to that, PaySimple also stores your data securely and also have functionality to automatically deposit funds. With a free setup, PaySimple will cost you $34.95 per month. 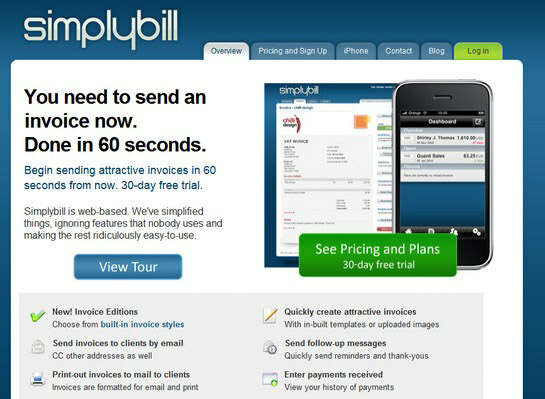 SimplyBill provides a wide array of options when it comes to online invoicing for freelance web designers. With SimplyBill you can also automatically create PDFs of your invoices and can also track payments online. Pricing plans include 3 different categories and range from $5 to $25 per month. 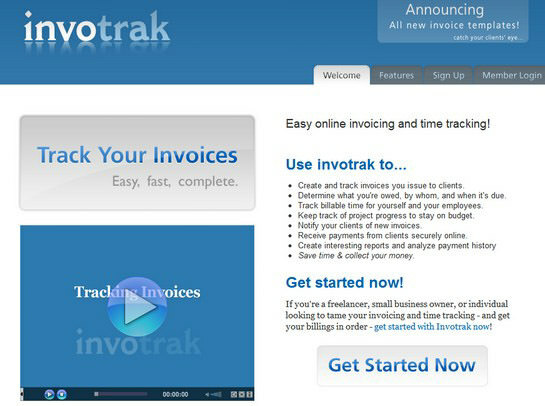 Rather ordinary, however Invotrak is a full-featured online invoicing and timesheet tracking application that can save you time and money. It’s also includes many of the features you need to speed up your billing tasks. In terms of pricing plans, Invoicera offers a free trial account and the paid plans range from $9.95 per month to $49.95 per month. 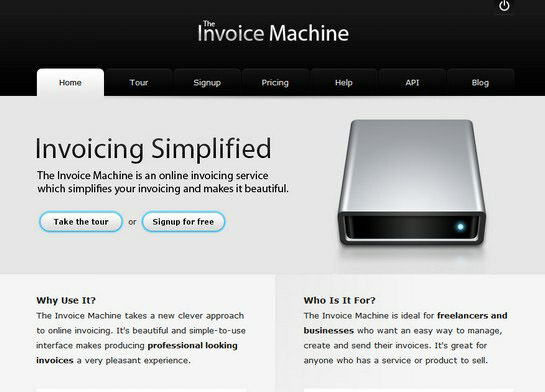 The Invoice Machine takes a new clever approach to online invoicing. 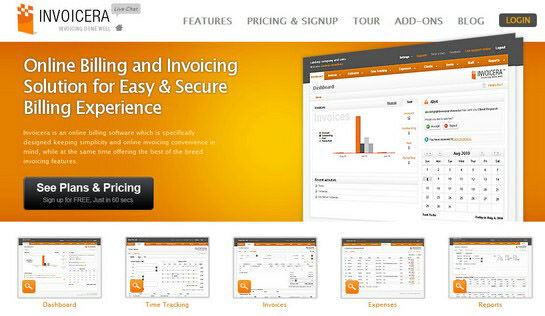 It’s beautiful and simple-to-use interface makes producing professional looking invoices a very pleasant experience. It is ideal for freelancers and businesses who want an easy way to manage, create and send their invoices. It’s great for anyone who has a service or product to sell. Small package is free to use and other premium packages range from $12 per month to $48 per month. Invoice2go is the fast and easy way to invoice, estimate, bill, collect and report. There are over 300 Templates to choose from. Even better all these templates can be customized to your own needs. Add logo’s, move fields you can even create your very own business forms. It has got a windows application plus an iPhone app too. 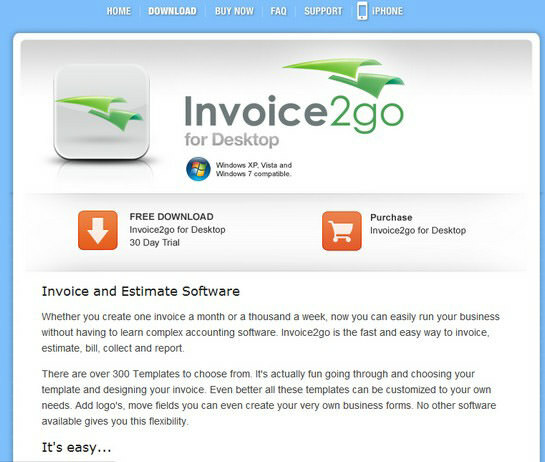 With a free 30 day trial, Invoice2go looks like a decent software to play with. Blinksale is perfect for anyone who needs to invoice clients for services or products sold. Blinksale is an excellent choice for attorneys, accountants, designers, IT professionals, software developers, journalists, contractors, engineers, architects, videographers, and more. 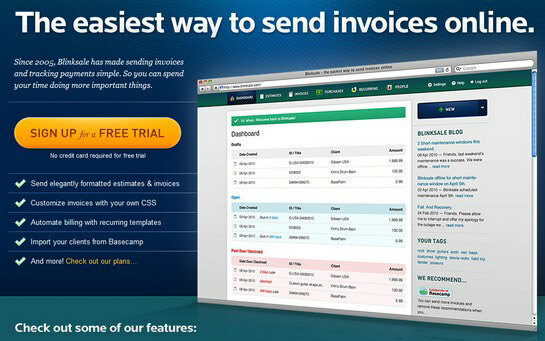 Basically, if you need to send invoices, Blinksale can work for you. Blinksale however does not have any trial or free plans. Its plans start from $6 per month and go up to $99 per month. 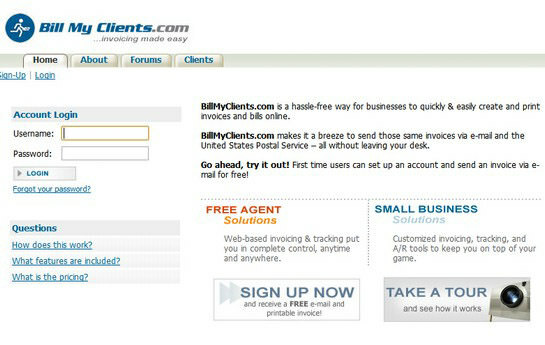 Billmyclients allows you to quickly and easily create and send an unlimited number of detailed invoices to your clients via e-mail for only $11.99 per month. For a negligible fee, they also send a hard copy to your client via the US Postal Service as well. Billing Manager is a web-based invoicing solution that lets you create invoices, send professional estimates, and helps you get paid online. In addition to online invoicing and estimates, Billing Manager lets you send PDFs of your invoices, send reminders to your customers, process eChecks, accept all major credit cards online and choose your currency. 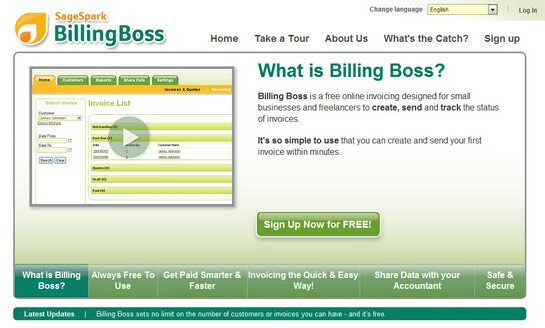 Billing Boss is a free online invoicing designed for small businesses and freelancers to create, send and track the status of invoices. The best thing is that all features and services provided here are completely free and there is no commercial upgrade version available. High level encryption is used to keep your information safe and secure. 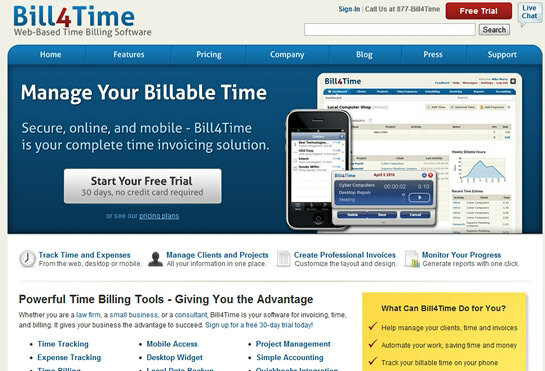 Bill4Time is a software for invoicing, time, and billing. It’s not only usable for freelance designers, but also very useful for lawyers, accountants, consultants, and other time billing professionals. And the best thing? They have a free desktop widget, provide free video training lessons and even have free mobile apps! Bill4Time offers a very limited free account and the premium package starts from $15.99 per month.